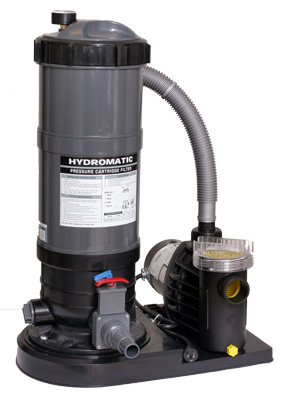 The Hydro Above Ground Cartridge Filter System is a high powered filter system that will deliver many years of trouble free operation. Hydro systems have set the standard for quality, superior flow rates, and unmatched water quality. The rugged filter tanks are constructed of tough, weather resistant, and corrosion proof polymer. Inside the filter tanks are extra large filter elements that produce water quality superior to sand without backwashing. Due to their large size, our filter elements require a minimum of cleaning, guaranteeing hassle free operation. The high powered pumps in these systems are energy efficient, allowing you to run your pump less while maintaining crystal clear water. The large spin lock makes removing and cleaning the cartridge a snap. Hydro systems are available in two sizes to fit all above ground pools. 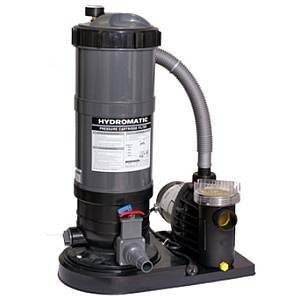 Both systems come complete with extra large cartridge filter, UL listed pump, integral base, all connection hoses, fittings and clamps, and two slide valves for easy cleaning. Both systems have a 1 Year warranty.